FERMANAGH LIVE Arts Festival 2018, returns bigger than ever. A small festival with big ambition, F Live Festival weekend is October 3rd to October 7th with an extensive range of exhibitions and fringe events with over 35 events in an action-packed programme, guaranteed to entertain, enthuse and inspire all generations. We are also proud to present Dylan Quinn’s moving performance Questions of a Man. Pat Lunny takes us On the Winding Banks, stunning exhibition of photos at Waterways Ireland. Acclaimed poet, Maria McManus returns home performing in Bards The Barge, featuring Fermanagh Writers on the Lovely Leitrim Barge Boatel. 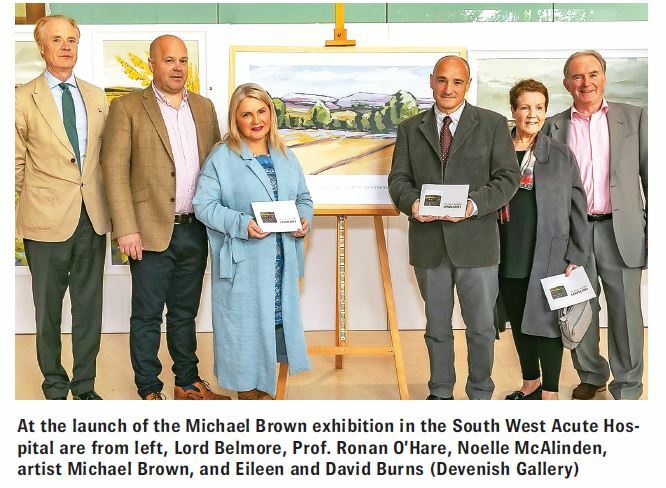 A visual arts trail of exhibitions includes emerging artists from SW College and local schools, Fermanagh Landscapes by Michael Brown, a Retrospective exhibition of Liam Blake at The Devenish Galleries. The powerful work of Paul Walls RUA in Walls on Water at Waterways Ireland. Interpretation a solo exhibition by Jill Mulligan at The Jolly Sandwich. Source and Sorcery at Hambly and Hambly. With workshops, children’s events and Masterclasses galore include an opportunity to excel in The art of Special Effects with Jayne Daley in the Body as a Canvas. Drama with Green and Blue, Kabosh Theatre Company, Comedy with Seamus O’Rourke. Classical Music, Jazz Brunch. 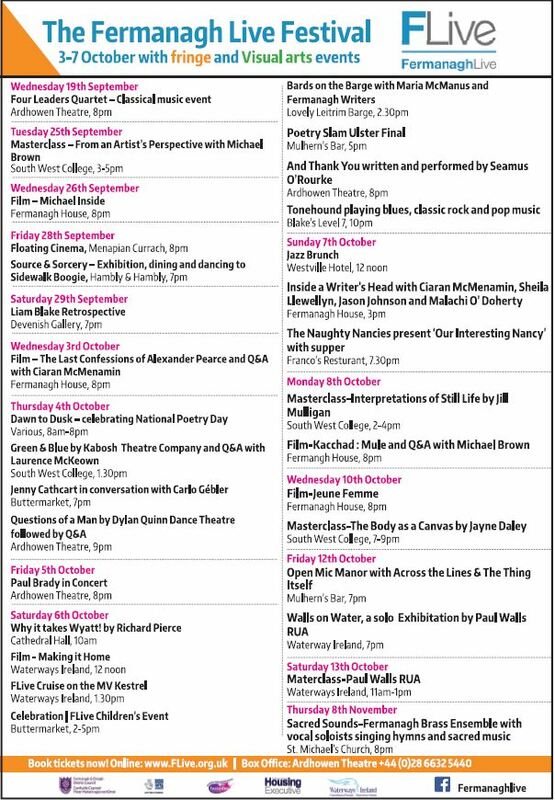 With Film and Floating Cinemas, we promote literature with Inside a Writers Head and welcome home accomplished authors Ciaran McMenamin, Jason Johnson, Sheila Llewellyn in conversation with renowned author and journalist Malachi O’Doherty. We celebrate Broadcaster and author Jenny Cathcart in conversation with Carlo Gebler. The Poetry Slam returns hosted by the prolific performance poet Frank Rafferty.